Pompano Beach, FL. – Titan FC will return to the Clark County Event Center on March 4th with Titan FC 37. The card will be highlighted by three title fights and a huge lightweight showdown between former Titan FC featherweight champion Desmond Green and former Titan FC lightweight champion Pat Healy. Fans will also see a familiar face as top ranked bantamweight contender Anthony Gutierrez returns to the Titan FC cage. The main event will feature former Titan FC 135lb. champion Brett Johns, who is seeking to reclaim the title he vacated at Titan FC 34 against Rose City Fight Club’s Ricky Simon. In the co-main event current featherweight champion Andre Harrison will defend his title against 9-fight UFC veteran Steven Siler and Tim Elliott will face Pedro Nobre in his second flyweight title defense. Titan FC 37 will be the first of eight scheduled events for 2016 for Titan FC. All shows will be streamed live and exclusively on UFC Fight Pass. Titan FC 35 drew a record crowd when they visited Ridgefield for the first time in September of 2015. Titan will look to repeat the success they had at the Clark County Civic Center with a card that will certainly entertain the great MMA fans of the northwest. For information on how to purchase tickets and support your favorite fighter, please visit www.cagetix.com/titan. Select the event, Titan FC 37, then select the fighter you would like to support and then select your tickets. UFC FIGHT PASS is available now at UFCFIGHTPASS.com on personal computers, Xbox One, Xbox 360, Apple TV, IPad, IPhone, Chromecast, Android, Samsung, LG Smart TV and Roku. Subscriptions are $9.99 month to month, $8.99 per month for six months or $7.99 per month for a one-year subscription. 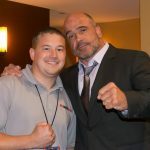 Purchased by Jeff Aronson in 2014, Titan FC is dedicated to establishing itself as a marquee MMA promotion for both up-and-coming & veteran fighters. Aronson immediately developed a #FansFightersFirst creed towards providing fans with great, action-packed fights and fighters an opportunity to showcase their skills on a competitive platform. In June of 2015, Titan FC partnered with the UFC (Ultimate Fighting Championship) to showcase past, present and future Titan FC events on the UFC’s digital streaming network, UFC Fight Pass. In doing so, Titan FC is now available to mixed martial arts fans across the globe.